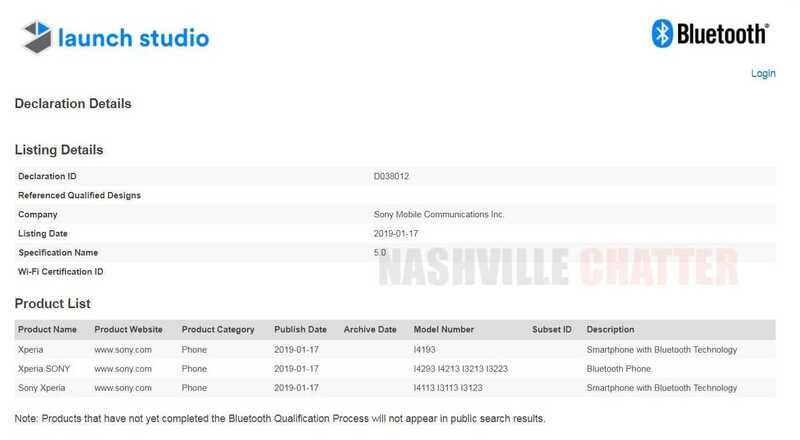 Several upcoming Sony mobiles including Sony Xperia XA3, XA3 Ultra and a mysterious new device have been certified by the Bluetooth SIG body. It was only yesterday that Sony sent official media invites to Italian and Russian media inviting them for Sony’s event at Mobile World Congress on February 25. Today we’ve found a bunch of Sony mobile phones listed in the Bluetooth website. The listing doesn’t reveal the actual names of the phones to be released but only the model numbers of the phones. There are three entries in the listing and the model numbers are I4193, I4113, I3113, I3123 which have the description as “Smartphone with Bluetooth Technology” and there’s another listing with models I4293, I4213, I3213, I3223 which are described as “Bluetooth phone”. We can confirm that these are new phones given the fact that the model numbers start with ‘I’, which indicates models to be released in 2019. Sony Xperia XZ4 or Xperia L3 or a New Line of Phones? Some of these models were already spotted in a listing in Eurasian Economic Commission (EEC) website exactly a month back, on December 17, 2018. The models approved back then were I4113, I4213 and I4312 and two out of these three models are part of today’s Bluetooth listing. We reported that these could probably belong to the Xperia XA3 series and Xperia L3 going by the model number conventions followed by Sony. 2018 Sony Xperia XA2 had the model numbers H4113/H3113/H3123 so I4113/I3113/I3123 spotted today in the Bluetooth listing should probably be Sony Xperia XA3. 2018 Sony Xperia XA2 Ultra was assigned the model number H4213/H3212/H3223; hence, I4213/I3213/I3223 found today should belong to Sony Xperia XA3 Ultra. The only other model numbers remaining are I4193 and I4293. Xperia L2 had the model numbers as H3311/H3321/H4331 and the model numbers of Xperia XZ3 were H8416/H9436/H9493. These aren’t in sync with the remaining models I4193/I4293 and they are certainly not Xperia XZ4 because the flagship/top-end phones tend to bear a higher number in the series. So these could belong to a new line of phones expected to be introduced by Sony this year. Stay tuned for more information and we’ll keep you updated.